74th day of the year (75th in leap years) with 291 days to follow. 1776 South Carolina becomes the first American colony to declare its independence from Great Britain and set up its own government. 1783 In an emotional speech in Newburgh, New York, George Washington asks his officers not to support the Newburgh Conspiracy. The plea is successful and the threatened coup d’état never takes place. 1820 Maine becomes the 23rd U.S. state. 1916 President Woodrow Wilson sends 12,000 United States troops over the U.S.-Mexico border to pursue Pancho Villa. 1965 President Lyndon B. Johnson, responding to the Selma crisis, tells U.S. Congress “We shall overcome” while advocating the Voting Rights Act. 1985 The first Internet domain name is registered (symbolics.com). 1989 The United States Department of Veterans Affairs is established. 1990 Mikhail Gorbachev is elected as the first executive president of the Soviet Union. A client recently brought her two cats in to my husband’s veterinary clinic for their annual checkup. One was a small-framed, round tiger-striped tabby, while the other was a long, sleek black cat. She watched closely as I put each on the scale. “They weigh about the same,” I told her. ~ Back up my hard drive? How do I put it in reverse? ~ I’m so tired…I was up all night trying to round off infinity. ~ I just got lost in thought. It was unfamiliar territory. ~ You have the right to remain silent. Anything you say will be misquoted and used against you. ~ I watched the Indy 500, and I was thinking that if they left earlier they wouldn’t have to go so fast. Wildflower native to the southeastern United States. After a heavy day’s digging at the archaeological site in Norway, the researchers uncovered a priceless statue of the ancient Norse thunder god. It was a wondrous piece of artwork – He had bulging muscles, and imposing stance, and of course his famous giant hammer. But most important of all, the eyes in his fierce-looking face were made of two giant rubies that glittered with a brilliant red colour. Of course, the two leading archaeologists on the dig were both determined that they should be the one to have their name listed against the discovery, and pretty soon the argument was intensifying to the point where the rest of the team, despite being exhausted after the day’s work, started to gather round to watch. The two of them continued squabbling for some time, and they provided the others with a great source of amusement for the evening, and by the time they finally gave up and called a truce, everyone else was feeling quite refreshed by the entertainment. Three mischievous boys skipped school one day and instead went to the zoo one day for an outing. They decided to visit the elephant cage first, but soon enough, they were picked up by a zoo security officer for causing a commotion. The officer hauled them off to the Security Office for questioning. The supervisor in charge asked each of them to give their names and tell what they were doing at the elephant cage. ~ Everyone has a photographic memory. Some don’t have film. ~ When the chips are down, the buffalo is empty. ~ Those who live by the sword get shot by those who don’t. A stagehand below would then pull a rope, the trapdoor would spring, and the actor would drop from view. The play was well received. When the actor playing the part became ill, another actor who was quite overweight took his place. When the new actor announced, “I descend into hell!” the stagehand pulled the rope, and the actor began his plunge, but became hopelessly stuck. No amount of tugging on the rope could make him descend. TODAY IN TRIVIA: How high can a cat jump under its own power? Some cats can jump up to five times their own height in just one leap. So make sure fragile breakables are stored out of harm’s way: opt for china cabinets with closing doors or enclosed display cases to protect heirlooms and collectibles from an acrobatic cat. ~ What does it mean to be dumbstruck? To be dumbstruck is to be so shocked or surprised that a person is unable to speak. ~ What were early dentures made from? Before all-porcelain false teeth were perfected in the mid-19th century, dentures were commonly made with teeth pulled from the mouths of dead soldiers following a battle. Teeth extracted from U.S. Civil War soldier cadavers were shipped to England by the barrel to dentists. ~ What are some other names for Trillium cuneatum? 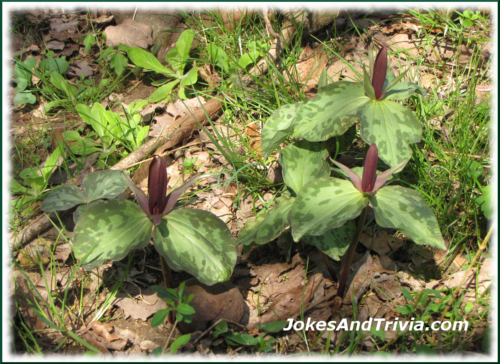 Blooming in early March to mid April, the wildflower Trillium cuneatum is commonly known as little sweet Betsy, or whip-poor-will flower, large toadshade, purple toadshade, and bloody butcher. QUIP OF THE DAY: Warning: Dates in calendar are closer than they appear.